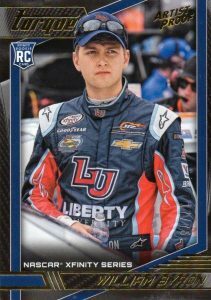 Revving up for another year, 2017 Panini Torque NASCAR brings a hit-based format to racing collectors. Every five-pack box contains three autographs and two relics. 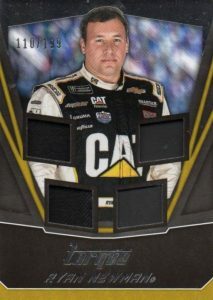 In addition to an expected assortment of base cards, parallels and inserts, 2017 Panini Torque NASCAR Racing includes one Clear Vision insert per box. However, like many Panini sets, Torque is mainly about the hits. 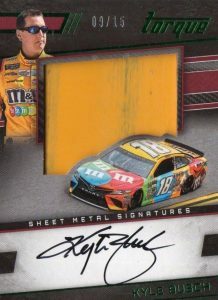 On the signed side of the product, 2017 Panini Torque NASCAR Racing features Jumbo Firesuit Signature cards, which offer on-card autographs and oversized relic pieces on a horizontal design, while Combo Materials Signatures opts for for a dual-relic look. 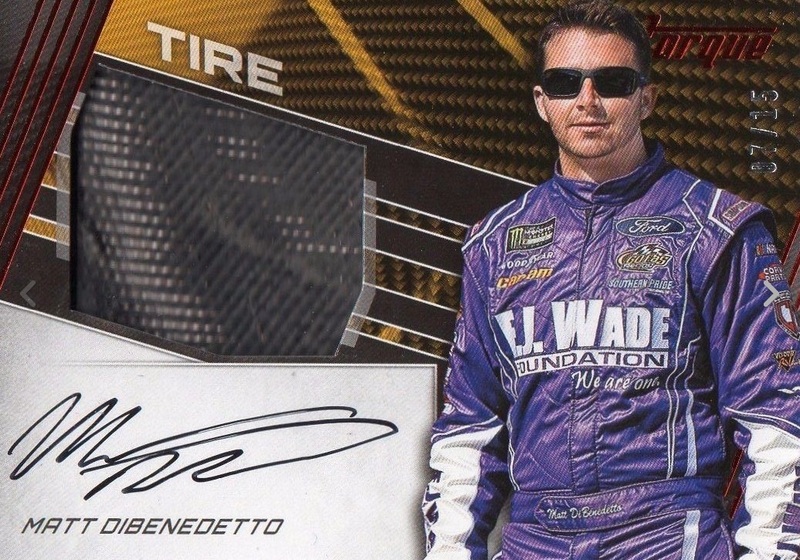 Also with hard-signed content, the Silhouettes Sheet Metal Signature and Silhouettes Firesuit Signature sets flip to vertical designs but still feature large memorabilia swatches. In addition to base versions, all these autographs are found in Blue (#/99 or less), Red (#/49 or less), Green (#/25 or less) and Purple (#/10 or less) parallels. 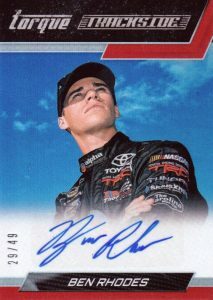 Panini also revealed that one "top 5 driver" autograph comes in every eight-box inner case. Nearly just as prominent in the set, the 2017 Panini Torque NASCAR Racing memorabilia cards include Raced Relics, dual-piece sheet Metal Materials, Quad Materials and multi-driver Pairings Materials. Similar to the autographs, there are Blue (#/99 or less), Red (#/49 or less), Green (#/25 or less) and Purple (#/10 or less) parallels for each relic. Showcasing the truly elite, the one-of-one Prime Associate Sponsor insert features entire brand logo patches. 2017 Torque Dual A.J. Allmendinger Chris Buescher 01 10 Auto Sheetmetal Error?? PARALLEL CARDS: Gold, Blue #/150, Red #/100, Artist Proof #/75, Purple #/50, Holo Silver #/25, Holo Gold #/10, Blackout 1/1, Test Proof Plates 1/1, Printing Plates 1/1. PARALLEL CARDS: Gold #/199, Holo Silver #/99. PARALLEL CARDS: Gold #/149, Blue #/99, Red #/49, Green #/25, Purple #/10. PARALLEL CARDS: Blue #/75 or less, Red #/49 or less, Green #/15 (*Bowman - #/25), Purple #/10. 33 cards. Shop on eBay. PARALLEL CARDS: Blue #/99 or less, Red #/49 or less, Green #/25 or less, Checkerboard #/10 (Elliott - #/9, Koch - #/5). PARALLEL CARDS: Blue #/99 or less, Red #/49 or less, Green #/25 or less, Purple #/10 or less. 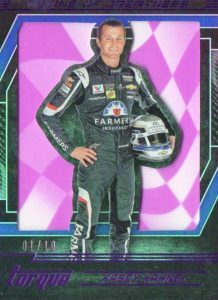 PARALLEL CARDS: Blue #/99 or less, Red #/49 or less, Green #/25 or less, Purple #/10 (*Jimmie Johnson 1/1). PARALLEL CARDS: Blue #/75 or less, Red #/49 or less, Green #/25 or less, Purple #/10 or less. PARALLEL CARDS: Blue #/99, Red #/49, Green #/25, Checkerboard #/10. PARALLEL CARDS: Blue #/99 or less, Red #/49 or less, Green #/25 or less, Purple #/10 or #/5*. PARALLEL CARDS: Blue #/50 or less, Red #/35 or less (*No Jeffery Earnhardt), Green #/25 or less, Purple #/10 or less. 18 cards. Serial numbered 1/1. Shop on eBay. Multiple Associate Sponsor versions exist for each card with up to 15 different options. 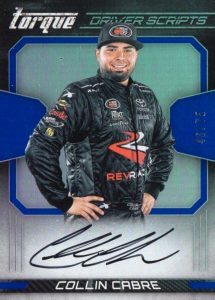 Card Versions: Associate Sponsors (#1-15) 1/1. All subjects not included in each version. View specific options with the full spreadsheet. 17 cards. Serial numbered 1/1. Shop on eBay. Multiple versions exist for each card with up to 6 different options. 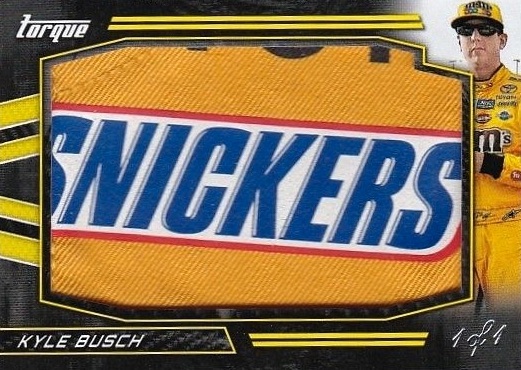 Card Versions: Flag 1/1, Goodyear 1/1, Manufacturer 1/1, Nameplates, NASCAR 1/1, Series Sponsor 1/1. PARALLEL CARDS: Blue #/99 or less, Red #/49 or less, Green #/25 or less, Checkerboard #/10 or less. Like the checklist! By my calculations 8 people are getting their first ever cards in this set. And Hershel McGriff, who I believe holds the record for longest career in all of sports (1950-2012), has an autograph in the set, which is his first auto and first card of any sort since 1998! That’s some good info Billy. Thanks! 2017 PANINI TORQUE RACING HOBBY SEALED BOX - PRE-ORDER!